FORT LAUDERDALE, Fla. (CNS) — The process for considering key moral questions are more thoroughly examined in revised guidelines governing Catholic and non-Catholic health care partnerships adopted by the U.S. bishops. Voting 183-2 with two abstentions June 14 during their spring assembly, the bishops adopted the revisions, which are limited to Part 6 of the “Ethical and Religious Directives for Catholic Health Care Services” developed by the U.S. Conference of Catholic Bishops. Under development since 2015, the revised directives govern moral questions related to the delivery of health care in settings involving cooperation among Catholic and non-Catholic systems. Bishop Robert J. McManus of Worcester, Massachusetts, chairman of the bishops’ Committee on Doctrine’s Subcommittee on Health Care, told the assembly a day earlier in introducing the directives to allow for additional comment and amendments that the new directives will help bishops decide whether a health care partnership can occur under the church’s moral teaching. The revisions offer more specific guidance to hospital administrators confronted with an increasingly complicated business environment. They also are intended to offer guidance to bishops as they witness health care mergers and collaborative arrangements in their dioceses. The revised directives became necessary in the face of widening consolidation within the health care industry as hospital systems look to reduce expenses and limit the duplication of services in any given service market. Father Michael Fuller, executive director of the USCCB’s Secretariat of Doctrine and Canonical Affairs, said the bishops’ intent is to help health care administrators better understand the moral and ethical issues behind complex business arrangements. 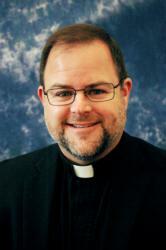 “The addition of these new directives is to help people navigate those complications,” Father Fuller told Catholic News Service. James Legrys, a longtime secretariat staff member, helped shepherd the revisions among the bishop members of the Committee on Doctrine, other USCCB committees, moral theologians, Catholic health care systems and entities such as the Catholic Health Association and National Catholic Bioethics Center. He said the nature of health care mergers has changed significantly since the 1990s when ethical and religious directives related to partnerships were first written. “In the ’90s, the vision was you basically merged Catholic (health care systems),” he said. More recently, Catholic systems and non-Catholic systems have become more willing partners, forcing administrators to understand how a merger or even a cooperative venture might be impacted by Catholic moral teaching. Such a more complex health care industry has caused theologians and clergy to more closely examine various issues including the question of cooperation with evil — abortion, stem-cell research, assisted suicide among the most common practices — and whether Catholic entities might be required to offer such procedures in any new merged arrangement. “The whole point is when a Catholic hospital system is talking to a non-Catholic system the very first thing they share and look at is the ethical and religious directives so that the non-Catholic can see the minimal requirements,” Father Fuller said. The questions emerging from the directives are not simple. The new guidelines expand from six to 11 the number of directives governing cooperative health care arrangements. Part six was rewritten in its entirety. Sister Carol Keehan, a Daughter of Charity and president and CEO of the Catholic Health Association, welcomed the new guidelines. “This is an attempt to update the guidelines so they are more workable for bishops and hospital executives in today’s world,” she told CNS. “Given the fast-changing pace of what’s going on in the health care world today, there are going to be more and more efforts to consolidate, to work together a bit better to see if we can make health care a little bit less expensive,” Sister Keehan said. “The great hope is that we can become, as a health care industry in general, a better and more efficient and more economical system” she added. The effort to revise the ethical and religious directives started with guidance from the Congregation of the Doctrine of the Faith at the Vatican after a “dubia,” or formal question, was sent in 2013 to the doctrinal congregation by New York Cardinal Timothy M. Dolan, then-USCCB president. Acknowledging the need for such collaborations, the Vatican said that while such partnerships are not inherently wrong, they must be viewed on a case by case basis.